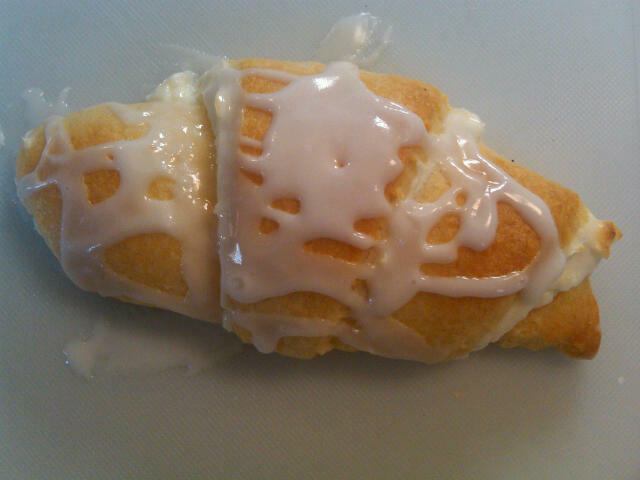 My family loves cheese danishes and I can make them from crescent rolls, cream cheese, half-n-half, and powdered sugar. That’s it! I mentioned them in my post on how to make chocolate croissants, and some friends have asked me to share this recipe as well. Start by preheating your oven to 375 degrees. 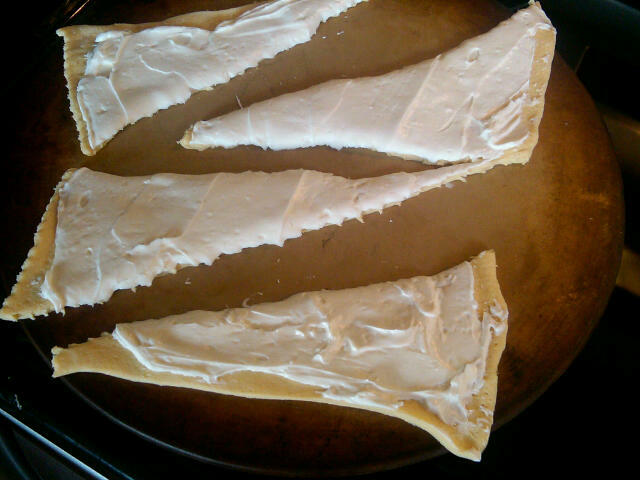 Unroll the crescent rolls and separate into two squares – four triangles per square. 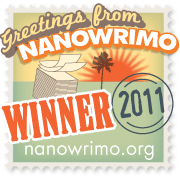 If you purchase the whipped cream cheese, my preference, you can just spread it on as is. Today, I only had the eight ounce block, so I softened it for about 20 seconds in the microwave and then added one tablespoon of the half-n-half, stirring them together to make a nice spreadable cheese. 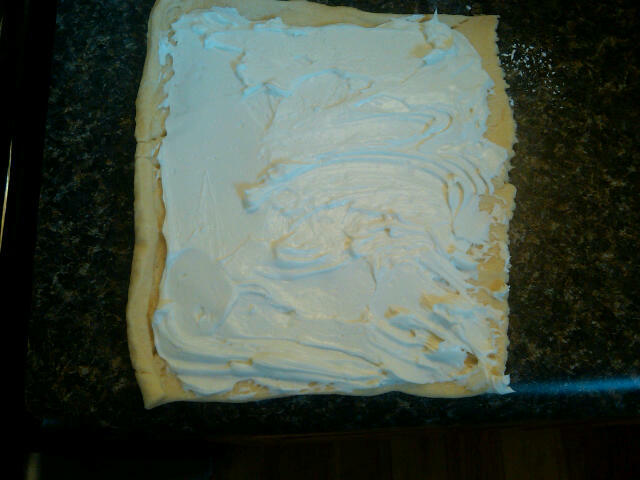 Then, divide that mixture in half and spread each square of dough with half of the cheese. Separate each square into their perforated triangles, there should be four per square. Roll up as you would a regular crescent, starting with the short side and rolling toward the tip. Bake on a nonstick sheet, or a baking stone which is my preference. Depending on your oven, this will take 11 to 13 minutes. Mine usually are perfect at the 12 minute mark. Mix together 1 cup powdered sugar and 1 tablespoon of half-n-half. This should be a little stiff but not so much that it doesn’t spoon easily. 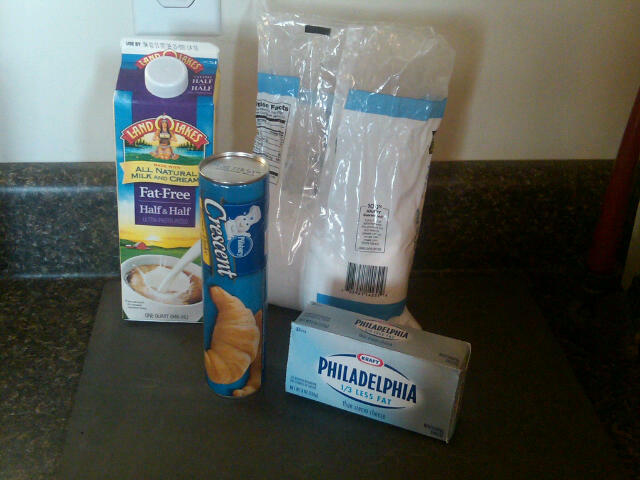 Today, I added about 1/4 tablespoon more to the sugar. But don’t get it too runny, because it will melt and glaze over the hot crescents. Just drizzle it over when they come out of the oven. That’s it! Four ingredients, less than twenty minutes prep and cook time. Simple, delicious. And a bonus, you can make them flavored by adding your favorite jam on top of the cream cheese before you roll the crescents up. Just don’t add too much, a teaspoon works fine per roll. My husband said your family will thank you! It is one of his favorite things! We had them for breakfast today, but they also make impressive desserts. Ohhh, you are good! Great illustrations. Had the aha! 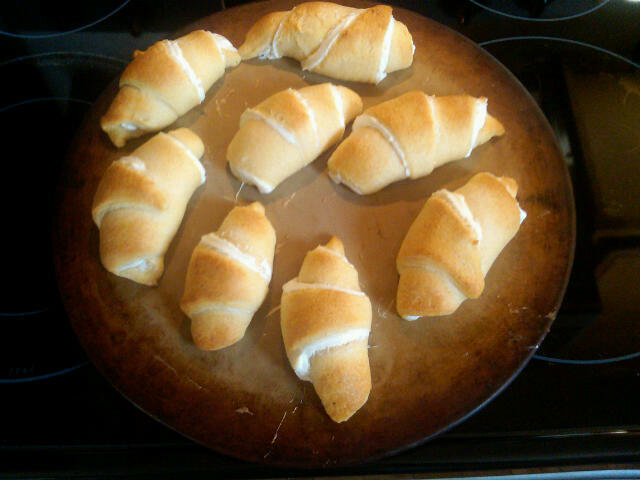 moment seeing exactly what you meant by crescent rolls. Try it for your next get-together!